Age of Republic – Jango Fett #1 delves beneath the helmet to explore the mysterious character of Jango. It also gives us a glimpse of young Boba in action. It’s a story of bounty hunters and on the job training. It’s also pretty fun. In this story, Jody Houser does a couple things. She explores Jango Fett’s role as a father and his view of the clones. It also explores what kind of bounty hunter he was. He ends taking on a mission with a bunch of other bounty hunters, people he’s never worked with, and he brings Boba along so he can get some experience. They’re searching for a Twi’lek who’s father wants her back, so it’s a retrieval mission. In fact they get pretty lucky and capture her without having to kill anyone. However, things get messy afterwards. The bounty hunters back stab each other, and Jango leaves Boba on his own to make the decisions. This is where it really gets interesting. We see Boba in action, defending himself, and taking others down. Even more interesting, we see who he decides to let live and die and why. It’s insight into the characters and a nice exploration of the Fetts. The artwork is also good. It’s not as polished, a little gritty, but there’s good detail and the aliens look neat. Seeing all the bounty hunters is fun, and the Fetts look good in their armor. The action is also done well. 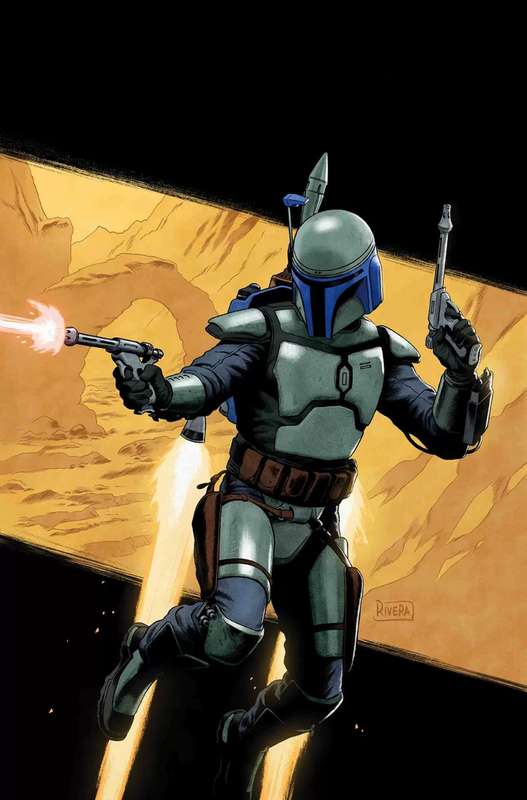 With a good story, good artwork, and giving readers some insight into the famous characters, Jango Fett #1 is actually worth checking out. If you’re a Fett fan, you should give this one a try. I give it a five out of five metal bikinis.